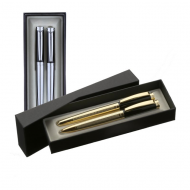 Custom Engraved Twist Ballpoint Pen and Rollerball Pen in a Case combines a stylish retail look and professional quality. 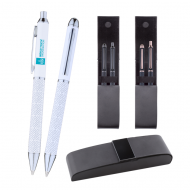 The lasered waves along with the gold or chrome finish in the LaoBan Ballpoint & Rollerball Pens are sure to provide a quality feel and look. 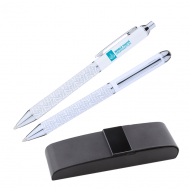 Available with silver or gold barrel and accents, this promotional gift pen set comes laser engraved with your company logo and makes a luxurious gift. Order today! 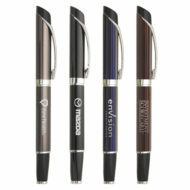 Laser Engraving of Your Logo Included on Each Pen! 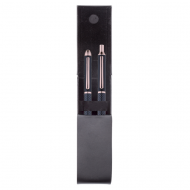 Make sure your company stands out from anyone else using promo pen when you gift custom engraved Montreal Pen for your advertising campaign! The medium black ballpoint pen features a unique triangle shape and comes inserted into a black velvet sleeve. This executive pen is sure to leave recipients in awe as they walk away with a tangible reminder of your brand! Order today! Laser Engraving of Your Logo Included!